If six channels is enough for you, you'll have to look long and hard to match the Gear4Music MIX02AU with its audio interface capability. Great value for money, USB audio interfacing, in-channel two-band EQ. Modest track count, plastic-feeling build, dreadful manual. Good things come in small packages, or at least that's what Gear4Music would have us believe of the Mix02AU. There's no doubt it is an extremely compact six-channel mixer and its wedge-shaped design certainly makes it ideal for desktop use, but is it any good? Read on to find out. The upper panel is laid out as two areas, with the lower, black section featuring level dials, pan pots, auxiliary send dials and low EQ controls. The latter are fixed at 80Hz, offering -/+15dB of gain. Whilst six channels are offered in total, only the first two are mono, featuring the option for microphone or line level signals. Channels 3/4 and 5/6 are designed for stereo sources such as synthesizers, with a single gain dial controlling both 'sides' of stereo input sources. Continuing our tour of the front panel, we move on to the upper area. The gain dials for the first two channels are found here and are for setting microphone signal levels. There's also another EQ dial here. This one controls high frequencies at 12kHz and has the same -/+15dB scope for boost or attenuation. Tracks 3/4 and 5/6 feature the same treble EQ control, whilst the panel space above tracks 3/4 is occupied by a 2-track system. This uses phono jacks for input and output and enables you to connect CD or portable music players. If you're intending to use the MIX02AU as a PA mixer and want to use pre-prepared music before a gig before switching to the mixer's main controls, this feature is sure to come in handy. The 2-track system has its own level control, which sits in the master section below. This area also offers level master dials for the main output, the headphone output and the auxiliary system. The upper front panel is completed by a phantom power (+48kHz) button, which enables the MIX02AU to work with condenser microphone sources. There's also a button to toggle the 2-track system to the main output, if required. The rear panel is where you'll find the connectors located. Channels 1 and 2 offer both XLR microphone inputs and line input sources, while channels 3/4 and 5/6 connect via 1/4" jack inputs. The auxiliary send port and headphone and master (stereo) outputs complete the line-up here. What really makes the MIX02AU stand out from its similarly priced competition is the USB port tucked away on the left-hand side of the mixer. This provides two channels of audio connectivity direct to your computer, and means you can run sounds through the mixer and record them directly into your music production software of choice. 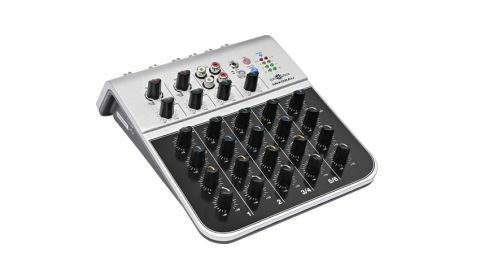 This makes Gear4Music's mini mixer an very attraction option, whether you're intending to use it in the studio or looking to record live performances onstage. While the MIX02AU's modest input count will put off those of you looking for more channels, there's no denying that for its price, this mini mixer offers tremendous value for money. It provides perfectly respectable audio quality with the added bonus - and a significant one at that - of audio interface capabilities. Add in a friendly, approachable feature set and reasonable levels of flexibility and this mixer is a winner.